This is one of the core elements of our business. 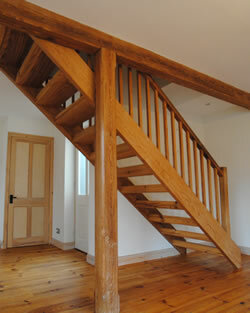 We can offer every aspect of joinery and carpentry through our time served craftsmen. Whether you require nonstandard bespoke joinery or off the shelf installations we can help. We pride ourselves on our attention to detail which is key to a quality job. We also work closely with customers and architects to achieve a high quality finish. Listed below is a sample of the joinery work we have recently completed. You can also view our Portfolio page for more examples of our work. 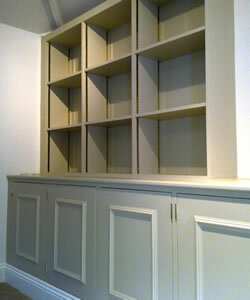 This client required a bespoke fitted bookcase with cupboards to fit inside an alcove maximising usable space. The unit was hand painted in a contemporary colour to provide a hard-wearing, long-lasting finish. 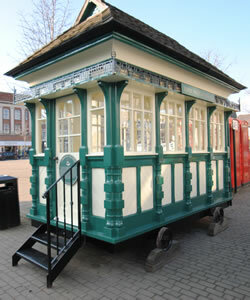 Harrogate Borough Council commissioned us to repair and restore this early 19th Century wooden Cadman's Shelter which is a well-known landmark in Ripon's city centre. 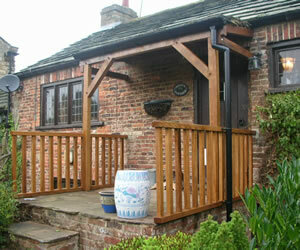 This traditional porch was constructed using English oak and a Yorkshire Stone roof complementing the period property. This porch was constructed using pegged stub mortise and tenon joints to replace the previous softwood porch which had rotted and become unsafe. 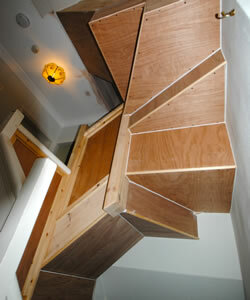 This staircase was constructed in a confined space to provide access to a recently converted loft. The picture shows the staircase being underdrawn ready for painting.